On Wednesday, April 16, 2014 at the New York Athletic Club in New York City, the Gabriela Mistral Foundation will present a special recognition to the ISMS organization. Coordinating a surgical mission is a unique experience each time. The variables are numerous and change with each mission. One lesson we have learned over the last 15 years is that every aspect is critical for a mission to be successful. Even a small detail can cause a mission to be cancelled. The stakes are high. There are patients relying on our services, the volunteers who donate vacation time away from their families and the donors who support these missions. It is imperative that these missions are successful. Over the years we have teamed up with many organizations and people. We have learned some tough lessons about the importance of proper logistics and planning. I could remember having our medical supplies confiscated on multiple trips or leaving a town at 4am in the back of a pickup truck because of political unrest in the region. These are colorful stories but the success and safety of the team requires a strong partnership with committed people. Every so often we meet someone whose work ethic and moral compass is truly inspiring. Gloria Garafulich-Grabois is one such person. She is the Director of The Gabriela Mistral Foundation and we worked together to make this year’s mission a success. This year’s mission to Chile was one of the most difficult because of the limited time we had to put it together. I initially was working on a mission to Bhutan that was aborted due to a lack of transport to its remote eastern region. This cancelled our trip in December 2012, three months prior to our departure. Ms. Isabel Sepulveda put me in contact with Gloria. We agreed that the Gabriela Mistral Foundation and ISMS would team together to sponsor a mission to her home country, Chile. Gloria was able to get the support from Hon. Julio Fiol, Consul General of Chile in New York which enabled us to put together the mission. As Gloria put it, for a long while it seemed like “mission Impossible”. There were many hurdles but in January there was one that seemed to doom the mission. The necessary temporary medical licenses were unable to be processed. Gloria was able to contact the first lady of Chile, Hon. Mrs Cecilia Morel, who took a personal interest in the mission. She was able to contact the health minister to have the licenses granted. In less than seven weeks the team had gear packed and the logistics of the trip were in place. It was an amazing effort. Gloria accompanied us during this trip and displayed grace under pressure. What impressed me most was her compassion for everyone. It could be a stranger on the street or the First lady of a country; she treats everyone with the same dignity and respect. The core members of ISMS-Team NY have been together for over a decade. Each year I’m proud and honored to be a part of the ISMS family. They perform seamlessly as a team and with the local healthcare providers. 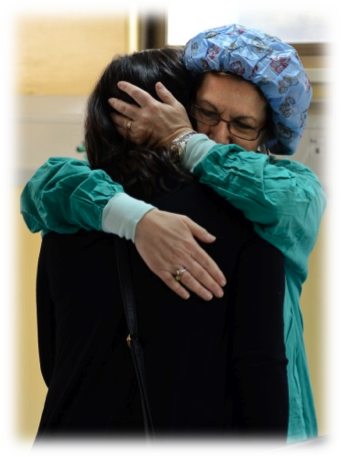 Each mission they adjust to a new environment, teach and provide exceptional care while being compassionate. It’s an unbelievable individual and team effort. I would like to thank the team and their families for their sacrifices every year. The local doctors and nurses of Hospital de Linares were welcoming and put in long hours without pay. They were invested in this mission as much as we were from day one. It was a testament to their professionalism and genuine care for their patients. A special thanks goes out to Dr. Allam, Grace McCarthy and Patti Mitchell for getting all the supplies organized and packed for the mission (all 79 bags and trunks). Lastly, I would like to thank everyone who donated their time, monies and supplies. Any of these missions would not happen without your support. You are the lifeline for ISMS. I hope that we are able to fulfill your wishes to bring quality care to those in need all around the world. I ask for your continuing support for ISMS and ISMS Team NY.